Playful but practical dress up bibs keep both parents and toddlers happy. 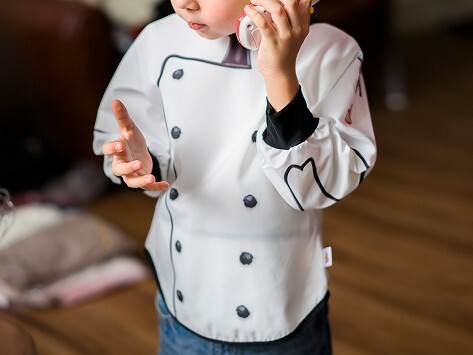 The all-over, photorealistic prints are highly detailed, engaging little ones and encouraging them to dream big, like whipping up make believe gourmet meals. The design is a full coverage art smock, mealtime bib (with a flip-up pocket to catch spills), and fun dress up costume all in one comfy, toddler-sized design. Great for little ones who are “too grown up” for a bib.